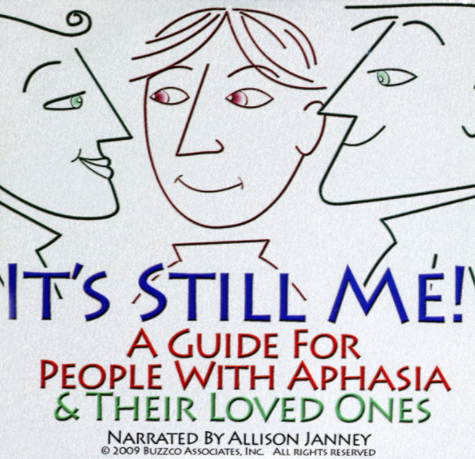 “It’s Still Me!” is a 17-minute guide for people with aphasia and their loved ones to help them learn how to communicate with each other more effectively. It explains what aphasia is, some basic facts about brain function, how it feels to have aphasia and finally demonstrates some ways to communicate without words. It acknowledges that the loss of words is devastating, both for those who have aphasia and for the people around them. More importantly, it also holds out hope for a rich and fulfilling future. Buzzco was delighted when Allison Janney agreed to narrate the film with her intelligent and caring voice. Four aphasia programs (New York, Texas, California, and Canada) focus-grouped the work-in-progress, and their input was invaluable in crafting the script. Marc Black and Candy wrote “Heart to Heart” the theme song of “It’s Still Me!” and he subsequently scored the movie. Shipping outside the United States is at an additional charge. After placing your order, you will be contacted by email with options for your consideration (e.g. first class or priority mail). You will be charged Aphasia Access' real cost for shipping, without any markup.